Pixar is bringing back the characters we all love and know in the ultimate “Flashback Friday” to the college days of Mike, Sulley, and a whole new crew. Travel back in time to the moment where Mike and Sulley meet in MONSTERS UNIVERSITY, and are instant rivals from the start. Their rivalry gets them in the least scary fraternity, the Oozma Kappas, abbreviated “OK”. Can Mike and Sulley overcome their differences and lead their team to victory in the famed Scare Games? I am a huge fan of Pixar and Disney, and I especially love not only the characters from MONSTERS, INC., but the very concept itself. Who would have ever thought that a movie about children’s nightmares would ever be so popular? The storyline itself is absurd, laughable even, and that’s the great thing about Pixar – they do the impossible and create an entire, wonderful universe centered on a fresh, out-of-this-world idea. That’s why I looked forward to this movie. In the middle, I realized that Pixar’s goal for this movie shifted just a bit. Although the core idea is no longer new, MONSTERS U is meant to bring back feelings of nostalgia. We can connect to the well-established characters on an even deeper level. There are many times in the movie when I get so sucked in that I nearly stand up and cheer loudly. I rooted for Mike and Sulley from the bottom of my heart. The visuals are top-notch – I could see all the textures of the Sulley’s fur to Mike’s hat as clear as day. I absolutely loved the score, which went perfectly with the movie – either upbeat and classy, or shiver-inducing and chilling when needed. Voice-overs by Billy Crystal and John Goodman are, of course, hilarious and heartfelt. 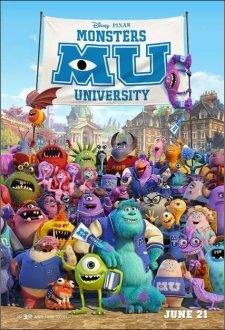 And you can’t forget the all-important scare-factor, but if kids enjoyed MONSTERS, INC., MU should not be too frightening for them. The Perks of Being a Wallflower is a diamond in the rough. To be honest, I wasn’t sure what to expect – even though I had read the book and all my friends said it was the best movie of the year. I had high hopes, though, because no movie could go wrong in the capable hands of the book’s author, Stephen Chobosky. The movie follows an introverted teenager named Charlie (Logan Lerman) who is entering his freshman year in high school. Two seniors, Patrick (Ezra Miller) and Sam (Emma Watson) take him under their wings. For the first time, Charlie feels accepted. The trio deals with the turbulence of the high school world including drugs, sexuality, and trauma. Charlie must learn to face his past while learning important life lessons that hold more than just a sprinkle of truth. Perks made me cry. And not just a few tears here and there, but full-on streaming down my face towards the end. What made me cry? I don’t know. I can’t say for sure. Perhaps it was the raw tangible emotion and chemistry on screen. Or maybe it was the tough circumstances these characters faced. Or it could have been the hope the characters clung on to, hope for a better future. Whatever it was, it touched me deeply in a place where only a few movies have ventured to address the confusion of adolescence with blunt honesty and yet, the theme of being infinite. The dialogue is memorable and witty, thanks to director Chobosky’s ingeniousness. Usually, I hold to the belief that books are way better than movies (this happens 95% of the time). But Perks of Being a Wallflower falls into the 5% category in which the movie lives up to the book’s hype – perhaps even surpassing it in a way that books simply cannot express. (As a writer, part of me can’t believe that I’m saying this). This is, in part, due to the gritty and flawless performances. Lerman brings out the quiet Charlie in a way that is immediately likable, yet holding something back that has troubled him for a long time. His character is delicate and silently observant, and certainly brings out the perks of being a wallflower. Miller plays the unusual, hysterical ringleader Patrick even better than I could have imagined. Emma Watson portrays Sam wholeheartedly without any clichés that usually come attached to the love interest of a story. In fact, calling her a love interest would offend many fans because she is so much more than just a side plot. The open acceptance that Charlie receives, the fleetingness of each moment, the perks (and drawbacks) of being not only a wallflower but also feeling infinite all adds up to a salute of acknowledgement that teens sometimes hit the bottom and still experience some of the breathtaking heights that life can bring. Reading the book first is recommended to add insight while watching the movie. Perks of Being a Wallflower is a movie for teens (13+) to embrace, laugh, cry and relate to – a simple yet complex gem to be held on to forever and always. Parental Guidance is a comedy that will catch families unaware and pull at their heartstrings. I thought I had prepared myself enough – at least, I knew it would have the entire theater shaking with laughter. What I didn’t expect was that this movie is an absolute tear-jerker. Artie Decker (Billy Crystal) and his wife, Diane Decker (Bette Midler) agree to babysit their three grandkids for a while. However, their infrequent visits to their daughter Alice’s (Marisa Tomei) home sets them as “the other grandparents.” To make it even harder, the kids’ type-A helicopter parents have set countless rules and regulations in the household. 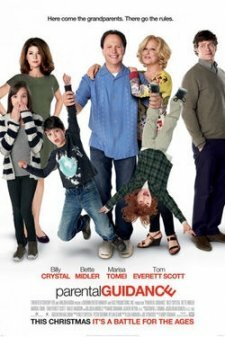 When Artie and Diane’s old school ways of teaching clash with their grandkids’ 21st century problems, the family goes through a series of comedic misadventures and misunderstandings before they finally realize that despite the gap of generations, it’s learning to bend that brings a family together. When you combine two of the greatest comedy legends, what you get is a heartfelt, down-to-earth, riproaring rodeo of fun. Every scene in the movie is filled with laughs for both kids and parents as well as hilarious hijinks that will thrill youngsters, including a sugar-high cake scene. The family’s relatable trio consists of Harper (Bailee Madison), an overachiever 12-year old; middle child Turner (Joshua Rush), a good kid with a stutter; and 5-year old Barker (Kyle Harrison Breitkopf) who has an imaginary friend. Artie and Diane try to connect with the kids in a way that will resound with viewers. Some parents may disagree with Artie and Diane’s methods of parenting. Artie frequently bribes 5-year old Barker to be on his best behavior and to keep secrets. Barker never gets serious punishment for his bad behavior. Diane talks to Harper about the good ol’ days when she and her friends would have a fine night, drinking. Harper responds, aghast, “You want me to drink?” However, the characters grow and learn their lessons along the way. This film has something for everyone, whether you’re a kid, parent, or grandparent. I felt the awkwardness between Harper and her crush. I exalted in that feeling of triumph with 9-year old Turner when he conquers his obstacles. I knew what it was like to lose a dream, and yet to find that there is more in life that’s waiting for the right time to show up. I could see the gap of generations and the formidable task of getting “up-to-date” with the “new school” way of things. I was touched by the mother and daughter relationship between Alice and 12-year old Harper. I understood the fragile father and daughter relationship between Artie and Alice. Parental Guidance is eccentric, affectionate, and has some of the best lines in the comedy genre. Just remember that this movie is rated PG, and I say this not because of objectional content, but because after parents watch with their kids, they’ll want to host a family reunion. Parental Guidanceis a must-see gem that will strike audience’s hearts – perfect for a fun family outing to the movies.